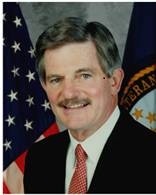 R. James "Jim" Nicholson, Senior Counsel for the law firm of Brownstein Hyatt Farber Schreck, is the past Secretary of Veterans Affairs. He was sworn into that office in February 2005 and served through September 2007. As Secretary of Veterans Affairs, Mr. Nicholson was the principal advocate for veterans in the U.S. government, ensuring that they received the care, support, recognition and dignity they deserve for their service to our country. As VA Secretary, Nicholson also directed the federal government's second largest Cabinet Department, responsible for a nationwide system of hospitals, health care clinics, benefits programs, and national cemeteries for America's twenty-five millions veterans. The VA employs over 240,000 people with a budget of approximately 100 billion dollars. Prior to serving in the Cabinet, Mr. Nicholson served as U.S. Ambassador to the Holy See from 2001 to 2005. In that position he became a well-known advocate in Rome for the elevation of human dignity, giving special emphasis to human trafficking, religious freedom, starvation and bio-tech food, HIV-AIDS and international terrorism. He was knighted by Pope John Paul II in October 2003 for his work representing the U.S. to the Vatican. Mr. Nicholson was born in 1938 and grew up on a tenant farm in northwest Iowa in a family of seven children. He is a 1961 graduate of the United States Military Academy at West Point, N.Y. He served eight years on active duty as a paratrooper and Ranger, then 22 years in the Army Reserve, retiring with the rank of colonel. While serving in Vietnam, he earned the Bronze Star Medal, Combat Infantryman Badge, the Meritorious Service Medal, Republic of Vietnam Cross of Gallantry and two Air Medals. Mr. Nicholson earned a master's degree from Columbia University in New York and a law degree from the University of Denver. He practiced law in Denver, specializing in real estate, municipal finance and zoning law. In 1978 he founded Nicholson Enterprises, Inc., a developer of master planned residential communities, and in 1987 he bought Renaissance Homes, whichbecame an award-winning builder of quality custom homes. In January 1986, Mr. Nicholson was elected to be the Republican National Committeeman from Colorado. In 1993 he was elected vice-chairman of the RNC, and in January 1997 he was elected chairman of the RNC, where he served for four years, overseeing the elections of 2000, including the election of President George W. Bush. Mr. Nicholson has been awarded seven honorary doctorate degrees, and was named a Distinguished Graduate from his alma mater, West Point, in 2005. He currently serves on the board of directors of the Federated Investors Fund, the Daniels Fund, and the Horatio Alger Association. He is married to the former Suzanne Marie Ferrell of Highland Falls, New York, who is an accomplished artist. They are the parents of three adult children.